The beds were large and very comfortable. The apartment is very large with a well stocked kitchen, including washer, dryer and oven. The couches in the living room were comfortable. The location was good for walking all around the city. Having 2 bathrooms was great so we could all get ready in the mornings. We loved the penthouse apartment with balcony. I wish I could buy it and live there! Excellent location and peaceful property. Staff was responsive as well. Great location and very stylish and comfortable apartment. Perfect location and beautiful apartment. Will stay there again. Just a short walking distance to everything! They do have parking available (at an extra cost). 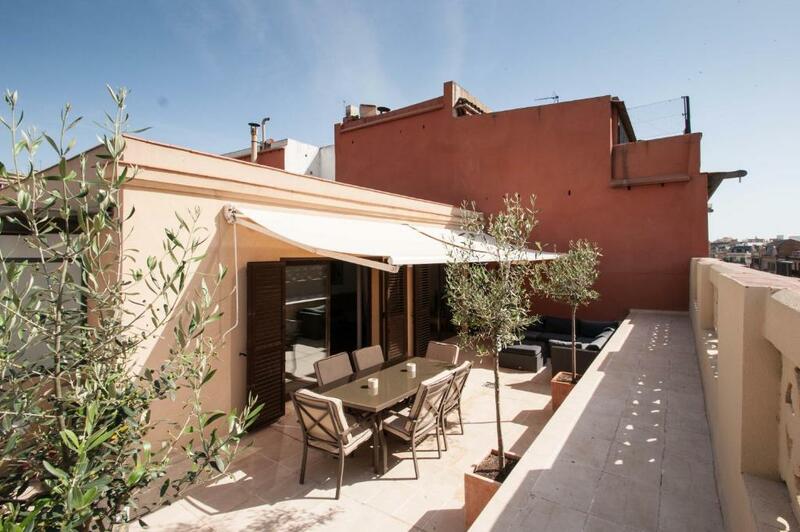 Great location close to the main square. Excellent facilities through out and perfect for four adults. Would definitely stay here again. Beds were very comfortable. Quiet. Loved the patio. Host was wonderful. The apartment was lovely. It was huge with 2 large settees in the lounge along with a huge dining table. Bedrooms were also very large. Kitchen had washer/dryer, dishwasher plus all other kitchen gadgets. As it was a family gathering Marianna treated us to a bottle of champagne which was lovely. Lock in a great price for BCN Apartments 41 – rated 9.3 by recent guests! 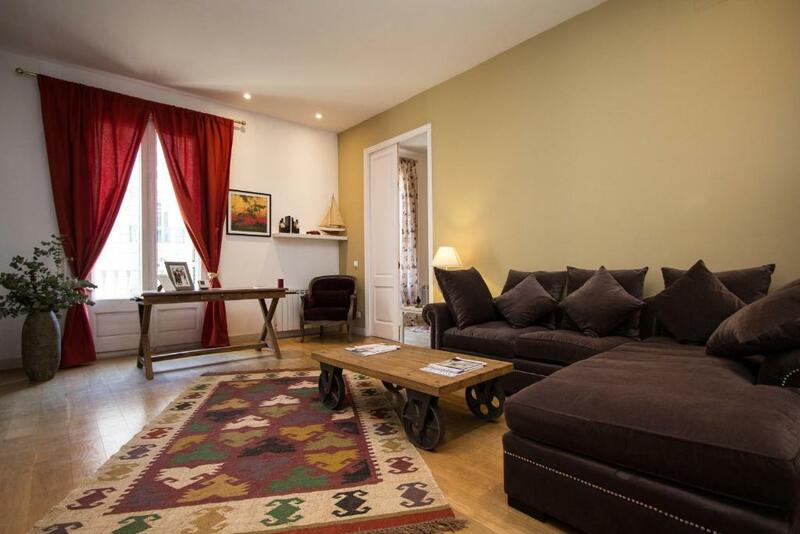 The elegant, air-conditioned apartments at BCN Apartments 41 include free Wi-Fi and flat-screen satellite TV. 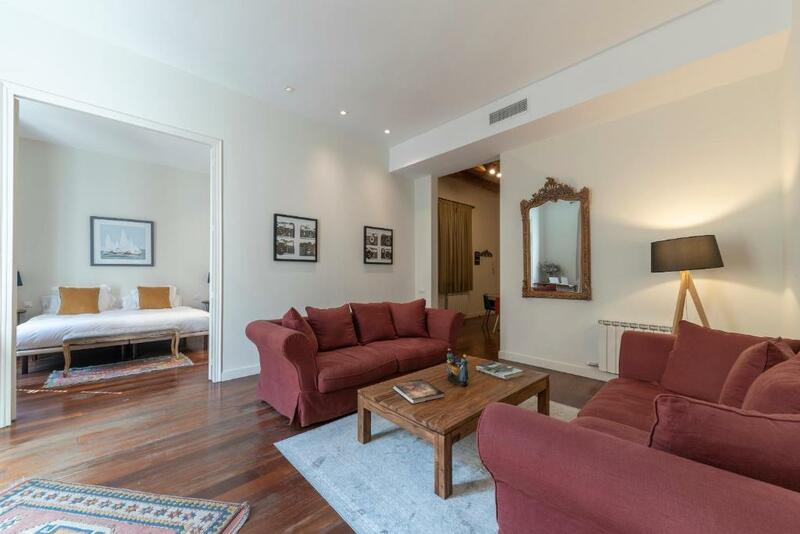 They are located just over a quarter mile from Barcelona’s Plaza Catalunya and Passeig de Gracia. The bright, spacious apartments each include a lounge area with sofas. Their kitchenettes have an oven, microwave and dishwasher. Many bars, restaurants and shops can be found in the surrounding streets of the Eixample District. The fashionable Born area is just a 10-minute walk away. The staff can provide tourist information, and the Arc de Triomf, Ciutadella Park and Barcelona Cathedral can all be reached in a 10-minute walk. Port Vell is 20 minutes away by foot. Urquinaona Metro Station is just under a quarter of a mile from the apartments and provides service to the beach. Airport buses are available at Plaza Catalunya. Private parking in the same building is available for an extra fee. 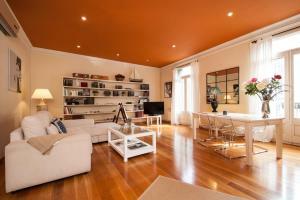 When would you like to stay at BCN Apartments 41? This air-conditioned apartment features 1 large double bedroom and 1 twin bedroom. Each bedroom has an private bathroom with a hairdryer and free toiletries. The kitchen is equipped with an oven, microwave, dishwasher, kitchenware, and a washer-dryer. This apartment includes a living area with flat-screen satellite TV. There is also a kitchen, equipped with an oven, microwave, and a Nespresso coffee machine. The apartment has 3 double bedrooms, one of them with an private bathroom, and 1 extra bathroom. 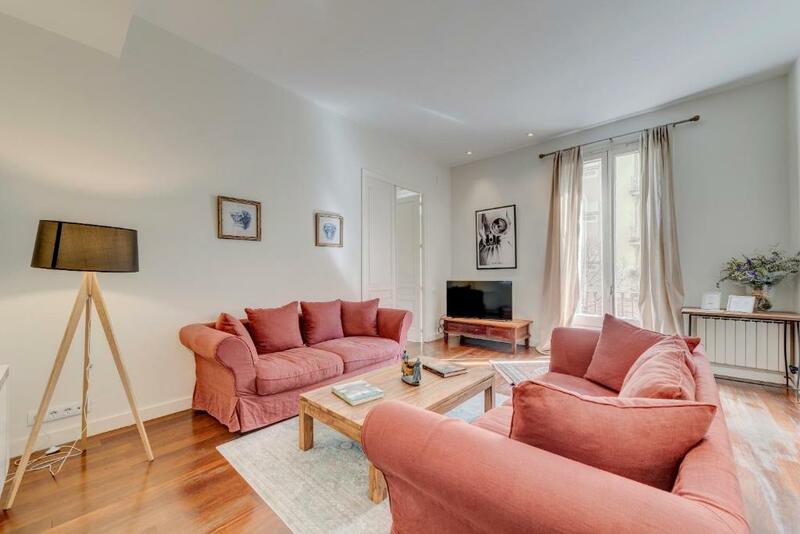 Featuring high ceilings and elegant décor, this air-conditioned apartment has 2 double bedrooms with an private bathroom with a hairdryer and free toiletries, and a living room with a sofa and flat-screen TV. There is a kitchen with an oven, dishwasher and kitchenware. A washer-dryer is also available. In BCN APARTMENTS 41 we want you to feel at home, with all the acommodations that you will need in an exquisite apartment of the iconic Eixample neigbourhood, nearby the city centre of the breathtaking Barcelona. We love Barcelona, its contrasts, the multi-cultural environment and the wide gastronomic offer as well as all the activities (sports, concerts, fairs, markets, festivals) that this city hosts. 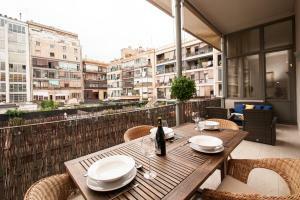 Our apartment is placed in Carrer de Casp, 41, at the Eixample neighbourhood. Our street has everything you will need during your stay to make you feel at home. There's a bakery, a pharmacy, two cafes, a mini market which is open every day until midnight, two banks (ATMs) and a super market. We got two metro stations, at only two blocks away from our location, Urquinaona square (L4 & L1) and Tetuan rotonda. Casa Calvet, the first house designed by modernist icon Antoni Gaudí is placed in our street, only one block away. Catalonia Square (central square of the city) and Paseo de Gracia are four blocks away from our door. Our building is nearby the city centre but with the calm enviroment of a residential neighbourhood. 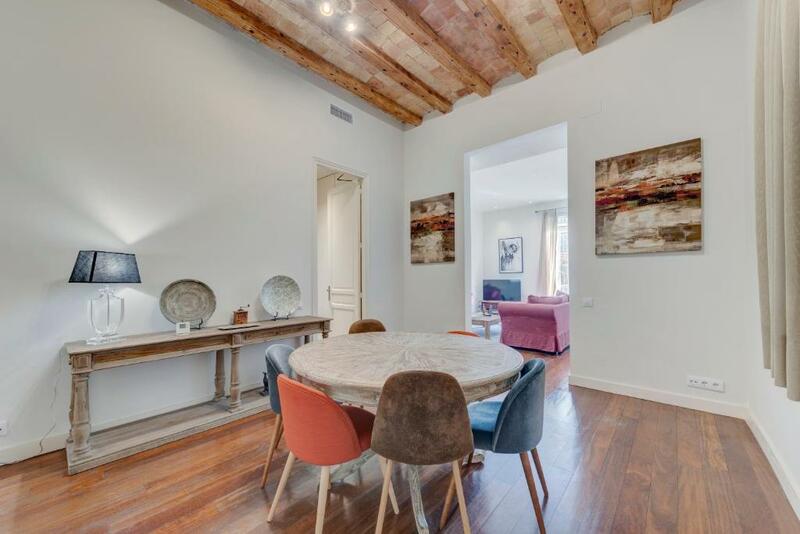 House Rules BCN Apartments 41 takes special requests – add in the next step! BCN Apartments 41 accepts these cards and reserves the right to temporarily hold an amount prior to arrival. Please inform BCN Apartments 41 of your expected arrival time in advance. You can use the Special Requests box when booking, or contact the property directly using the contact details in your confirmation. A damage deposit of EUR 200 is required on arrival. That's about 226.05USD. This will be collected by credit card. You should be reimbursed within 7 days of check-out. Your deposit will be refunded in full by credit card, subject to an inspection of the property. Everything is awesome! Perfect for a group of friends or family stay. Kitchen is well equipped and we enjoyed cooking there. Bed/pillow are super comfortable. Would definately stay again for next visit. Building noise was bad 8-5 but I’m sure this is temporary. Great location and beautiful apartment with lots of space. Having a kitchen would be a great boost. Great location and spacious apartment on the 2nd floor. High ceilings, nice decor and 2 modern bathrooms and a kitchen. The apartment was very clean and had everything we needed. The host was very friendly and quick responding on email with booking questions and on phone at check out. Big plus that they offered to store our luggage after check out, and that we could come back at any time that day and pick it up. Excellent when you have an afternoon flight home like us, and you don`t want to bring suitcases around the city all day. The balcony is small, with room for 2 only. There was some wear and tear on the apartment, cracked floor tiles, broken lamps, scraped paint. Small issues for a great place to stay. This was perfect for us! As of the apartment, it was well equipped, lovely large bath towels, SUPER comfy beds, great patio area for relaxing in. Well laid out bedrooms. Having the opportunity of parking our car too, made our trip more relaxing. The host communicated well with us and we were welcomed to the apartment, very nice! As for the location, it is in a fantastic location for walking around the city. The place was amazing and super confy. I after 3 years traveling to bcn, I this is by far our best rental of all. We felt like home. Ramone was very accomodating and made us feel comfortable right from the start. I don’t normally do reviews but I have to say BCN 41 was more than I imagine. The whole was amazing, clean and spacious. Had everything we needed. Perfect location for exploring Barcelona. I would definitely return. Truly no negative and can’t think of improvements to suggest. It was warm, the beds were great, kitchen genuinely stocked and there were even wines and snacks available to purchase. 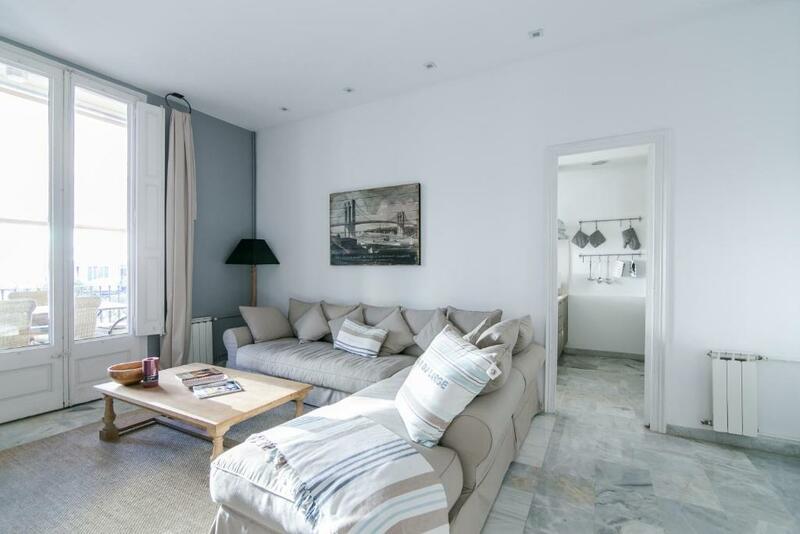 This spacious, comfortable apartment is the perfect Barca accommodation. The location was ideal and the neighbourhood was so safe I wondered at night with my young children. The hosts were amazing and accommodating to a flexible checkin. We would stay here again if we visit Barcelona and recommend our friends and family.